Amidst an aura of optimism and calls of ‘reincarnation’, Romania were close to ruining Laurent Blanc’s quietly-impressive start to his reign as Les Bleus’ national coach this week. Instead of opting for the 4-3-3 that got the French a formidable win against a Bosnia side, M. Blanc preferred the 4-2-3-1 system with the fleet-footed Samir Nasri picked for the role behind Karim Benzema, leaving Yoann Gourcuff, who, it has to be said, is lacking form of any definition at the moment, on the bench. France won this game two to nothing, which at first glance, is an adequate and expected result, but it was only through late goals and some much-needed changes late in the day. Laurent Blanc may have dismissed the idea that his team were made to look like equals by an organised and well-drilled Romania side, but it was only until late in the game when two well-thought substitutions entered the fray that the French looked like deserved winners. There is a point though – to discover how a French team were nullified for the first 75 minutes by a Romanian team who are now ranked lower than Northern Ireland in the FIFA World Rankings – and how Romania managed to continually look dangerous on the counter. As an aside, the decline of Romanian football is astonishing – it was only in 1997 that the Romanian side were ranked #3 in the World Rankings and had the likes of Gheorghe Hagi and Adrian Ilie in their ranks. With five minutes to go in the first-half, one could sense there were going to be spluttering jeers at the point of half-time. Although the French monopolised the first-half, the Tricolorii worked hard without the ball and countered dangerously when they won the ball back. The first-half can be characterised by looking at the shape of the Romanian side – they were narrow, organised and pressed in specific areas. Romania's basic shape without the ball. Romania were narrow and extremely organised, always keeping strong 'linkages' between each position. Romania pressed as soon as the ball moved forward from defence. The struggle to get the ball forward for sustained periods of time resulted in the French forwards having to drop deeper to move the ball forward. This allowed Romania to compress their half sufficiently enough so it halted any French moves building up. The Romanians aimed to allow the French centre-backs have the ball as much as they want, but as soon as the ball moved to someone else, the Romanians pressed. These trends continued into the second-half – Romania continued to break well and place everyone behind the ball – and it is only down to a spectacular save from Hugo Lloris that Romania didn’t open the scoring. What was notable was Karim Benzema’s tendency to drop very wide, sometimes in between full-back and centre-back, sometimes between the full-back and the sideline. This caused a shift in the French attack, it brought Malouda to a more central position, Valbuena further forward and centrally and Nasri pushed on. This movement also brought overlapping runs from Gael Clichy. This progression to a more fluid attack continued throughout the match, even with new introductions entering the game. Benezema continued to drift deep and wide throughout the game. The simple twisting of the French attack made the team striker-less during some periods – a footballing trend that has been developing for some time now. This did not have its desired effect, the Romanians kept a solid defensive shape throughout this period where Benzema drifted to the left – rendering the change pretty ineffective. 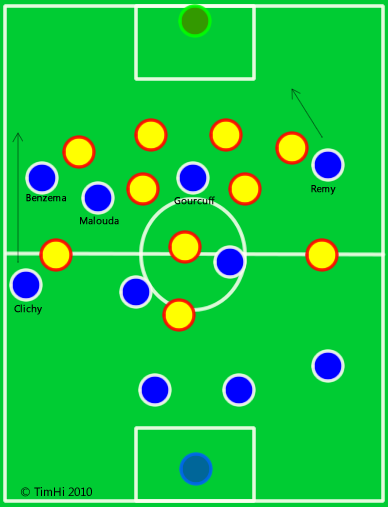 Without anyone looking to dissect the Romanian defensive line, it was very easy to keep a narrow and high-line, the passing was not penetrative enough to have the Romanians scrambling. Valbuena, for as good as he is with the ball at his feet, is not a winger or forward who looks to run beyond the defensive line. Without anyone to do this, the French style of play was attractive yet lacked an incisive edge. Benzema and Nasri managed to get the Parisians to pick up their drapeau tricolore and wave them without a hint of hypocrisy after their half-time boos. Both managed to squander the clearest of opportunities in the game. The Romanians however looked to exploit Clichy’s poor decision making the rashness in his movement forward. It was only until M. Blanc made some attacking changes that the dynamic of the game changed. Until this point, Les Bleus were happy to play in front of the Romanian back-four, never really looking to stretch the defensive line. Valbuena, who looked to play in between the lines was replaced by the pacy and direct Loïc Rémy on the right. Remy moved higher up the pitch, looking to run at the left-back and to move into a auxiliary centre-forward position when Benzema drifted wide. 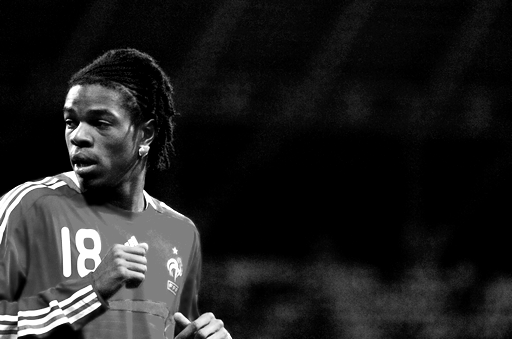 With Remy now able to stretch the Romanians in midfield and defence, it gave France a stronger hold on the game. Remy continued to scare the Romanian defence with his runs from outside inwards and it was from an Alou Diarra through-ball over the top that Loïc Rémy chased and broke the deadlock. Remy's runs left greater space between the midfield and defence, as well as providing a different method of attack. Rémy’s goal itself showed his terrific pace and composure whilst running at speed. Even with a Romanian central defender bearing down on him, he managed to get his shot away without hesitation or second-thoughts – it really was an impressive goal. An intelligent move from Blanc; recognising that the Romanians could handle the ball being playing in front of their defence, the introduction of pace and finishing ability changed the game. The Romanians, who were pushing higher up the pitch as the game wore on, were un-done by their high-line and the introduction of Remy. The French style of play for the previous 80 minutes drew the Romanians into a defensive lull – and rightly so, they had reduced France to only a few chances, but this lack of adaptability to the introduction of Remy was their ruin. The crafty débutante Dmitri Payet was introduced soon after the Rémy goal and his composure and vision in the box added some much-needed gloss to the scoreline. The two-nil win made the France supporters go home with achy wrists as they continued to waggle their flags for the last five minutes, symbolically showing acceptance of a French performance that could have been, if it wasn’t for Rémy, a frustrating and dissatisfying display. ← Removing the Romanticism from an Unexpected Victory: Denmark – Euro ’92.